The new album titled "Happy" is due out November 18th. 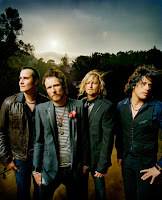 Currently Weiland is touring heavily with Stone Temple Pilots preparing to record a new album as well. According to an Aerosmith fansite Steven Tyler has said the band will head to the studio at the end of the month to begin recording a new album. Brian “Head” Welch formerly of Korn is preparing for a support tour of his solo release Save Me From Myself due out September 9th. You might think I'm crazy but I actually was a fan of Weiland's solo album "12 Bar Blues." I am excited about STP being back together.